(CNN) -- Seven-time grand slam champion Venus Williams crashed out of the French Open on Friday as she was thrashed 6-0 6-4 by Agnes Szavay of Hungary. 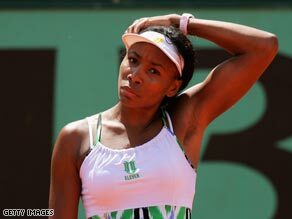 A dejected Venus faces up to defeat to Szavay in the third round of the French Open. It was the third straight year that Williams has gone out at the same stage on the clay of Roland Garros, but defeat to 29th seed was still unexpected. Third seed Williams had charted a perilous course to the last 32, saving a match point on Thursday against Lucie Safarova, but her luck ran out against Szavay. The Hungarian took the first set in 30 minutes without dropping a game, but Williams hit back in typical fashion to move a break ahead in the second set. But a double fault allowed Szavay to level at 4-4 and after holding her own service she broke the Wimbledon champion again to seal the biggest win of her career. She will next take on Dominika Cibulkova of Slovakia for a place in the quarterfinals. Earlier, Cibulkova defeated Gisela Dulko of Argentina 6-4 6-2. Williams has never won the French Open, her best performance a defeat in the 2002 final to sister Serena. Defending champion Ana Ivanovic continued her improved form on the French clay by beating Iveta Benesova of the Czech Republic 6-0 6-2 to reach the last 16. But a tougher test awaits in the fourth round against either ninth seed Victoria Azarenka of Belarus or Spain's Carla Suarez Navarro. Ivanovic reached world number one with her first grand slam triumph last year but slipped own the rankings as she struggled with form and fitness. "My game is coming back and I feel more comfortable," she told the official tournament Web site www.rolandgarros.com. Top seed Dinara Safina also impressed as she made quick work of third round opponent and fellow Russian Anastasia Pavlyuchenkova. Safina, who had dropped just two games in her opening two matches, won 6-2 6-0. She is chasing her first grand slam title having lost to Ivanovic in last year's final.